There's a full moon tonight. Things might get crazy, or they might get crazy delicious. I'm an ardent fan of all things barbecue (as is my right as a Southerner), though I'm strongly in the sweet sauce camp--that watery, vinegar-heavy stuff just ain't for me. Imagine my delight when a company in Alabama contacted me and offered to send me supplies to achieve barbecue perfection! Full Moon Bar-B-Que, a southern-style BBQ restaurant with locations all over Alabama, sent me their Ultimate Flavor Pack, loaded with Full Moon’s Southern Seasoning, Famous Chow Chow, Award Winning BBQ Sauce, and very sought-after Alabama White Sauce. Yeehaw! Rather than trying out a completely new recipe to feature some of their products, I wanted to see how their sauce held up in one of my standbys--plain ol' shredded chicken barbecue. Because I'm always looking for ways to use up stragglers hidden in my fridge, I tossed in a nearly full container of pineapple that needed to disappear, so the resulting meat was a little bit different from our standard and really, really tasty. When the moon is full, don't take unnecessary risks--stick with the tried and true! Poach the chicken in a medium saucepan until cooked through, then let it sit until it's cool enough to handle. Using your fingers or two forks, shred the chicken into smaller pieces and add it back to the sauce pan. Sprinkle on the salt and pepper, then pour in the pineapples and their juice, sauce, vinegar, and water. Let this mixture cook on medium-low for a while, at least an hour, until everything is warmed through and nicely flavored. Serve between two slices of bread with coleslaw, on top of tortilla chips as nachos, in a quesadilla with cheddar cheese, or any which way you can. Barbecue is delicious, I think because it is so messy. The more napkins, the better! This looks quite delicious. I've not done barbeque with pineapple, will have to put this on my list. Thanks for sharing! That sandwich looks very tempting. I bet the chicken filling tastes really good. My kind of sandwich - yum. I'll be on the lookout for the barbecue sauce. The saucy chicken looks so good! Love the slaw on top too. I'll have to keep an eye out for these sauces. I've never tried white sauce but feel I need to and soon. Pineapple and chicken sounds so good. Have never tried white BBQ sauce, but sure am willing to try it. Am thinking won ton cups cooked and filled with this would be delish with company coming. Hmmm, white wine or rose... That I'll leave up to them. Tks, Grace. The filling reminds me of my favourite sweet and sour chicken :-)) I certainly will love the sandwich too. The pictures of this look really interesting! Might just have to give this recipe a shot. Pineapple and chicken go really well together! I'll have to look for them! This chicken looks and sounds delicious, I like the idea of pineapples in it...the picture is really making me hungry. Sounds like a great way to serve this sauce, full moon or not! You've convinced me. I need to do more barbecue! That sandwich looks delicious! I love the chicken filling! What beautiful photos and the food looks so delicious, I like to have one right now. I don't know if we can get the sauce here in California. Now that looks divine, Grace. 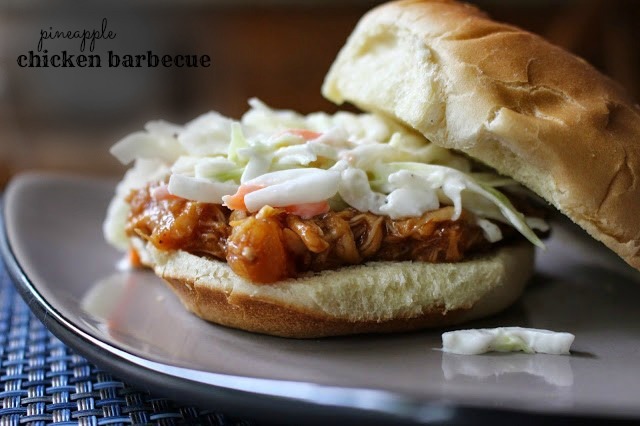 Love BBQ sandwiches! Will be on the lookout for that sauce.